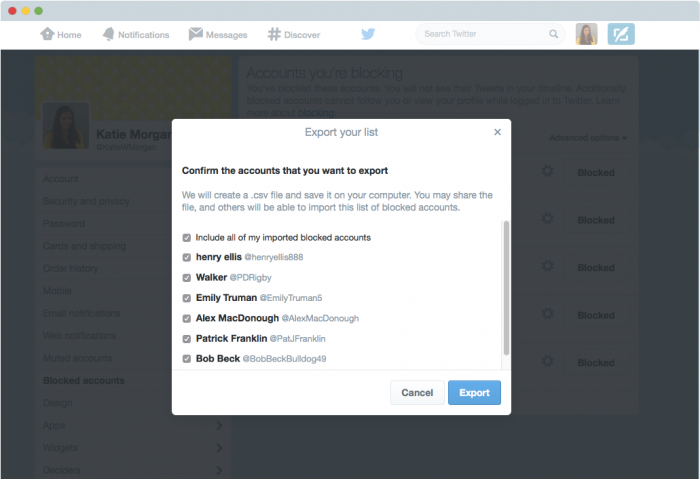 Twitter is making it a lot easier for users to protect one another from abusive accounts: you can now share your blocklists. To export your list or import someone else’s, you simply need to go to your blocked account settings on twitter.com, click on the advanced options menu on the top-right, and select import or export from the drop down menu. It’s a particularly useful feature for communities on Twitter who may suffer from frequent harassment by the same Twitter accounts, as such the women who were targeted during Gamergate, for example. This way, users can simply share a list of the misbehaving accounts with others who may be victimized by the same accounts. Of course, you could achieve the same effect manually, but this is much quicker, especially for people who have blocked dozens or even hundreds of accounts. It’s the newest step in Twitter’s recent moves towards making its platform safer for all users. In December, it made it easier to report abusive comments, and introduced a revamped blocked-user page. In April, it gave its customer support team the power to temporarily lock unruly accounts.